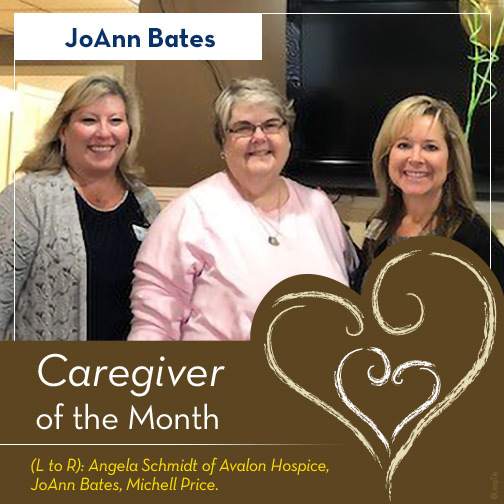 We can’t say enough about the recipient of our most recent caregiver award. Her story below will shed some light on the amazing person known as JoAnn, but seen as so much more to all of those lucky enough to come into contact with her. I met Jo Ann while she was caring for her mother as she lived in a nursing home. She would go to the nursing home almost every day, sit with her mother who could not move or speak and spend hours talking to her and loving on her and the staff. She would bring thoughtful gifts to the staff, such as ornaments at Christmas or donuts for breakfast. An example is bananas, with words written on them in Sharpie, such as, “You are so a-PEEL-ing!!! !” Jo Ann loved on the staff and they loved on her mother. Jo Ann would decorate the walls in her mother’s room different each month, depending on the season, the holiday, and if something significant happened in her mother’s life during that month. This way anyone who walked in could carry on a conversation with her mother by just looking at the walls. Jo Ann also attended and still attends and helps out with the Support Group at the nursing home where her mother lived. She is a great graphic artist and does calligraphy and puts up the fliers on Sunday Visitation Day and attends the meetings and encourages and participates fully, helping others in the same situation that she is in.